Aluminum Neutral Bars | CMC Type NA Neutral Bars | Cal Fasteners, Inc. Type NA neutral bars from CMC are manufactured out of specialty 6061-T6 aluminum alloy to ensure maximum strength and unparalleled electrical conductivity. 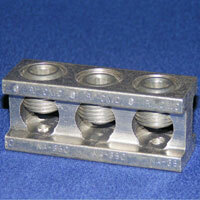 CMC’s aluminum neutral bars are dual rated for use with both copper and aluminum conductors. They are electro tin plated for low contact resistance and corrosion protection, ensuring superior performance and long working life. Assembly and installation are easy, requiring only an allen wrench or screwdriver (depending on model). All models are UL and CSA rated and RoHS compliant. All CMC products are manufactured in North America. If these neutral bars are not right for your application, we also offer CMC type SCB neutral bars. Request a quote on type NA aluminum neutral bars, or contact Cal Fasteners to learn more.